I've not been able to perk much interest in playing Warhammer at the local club. 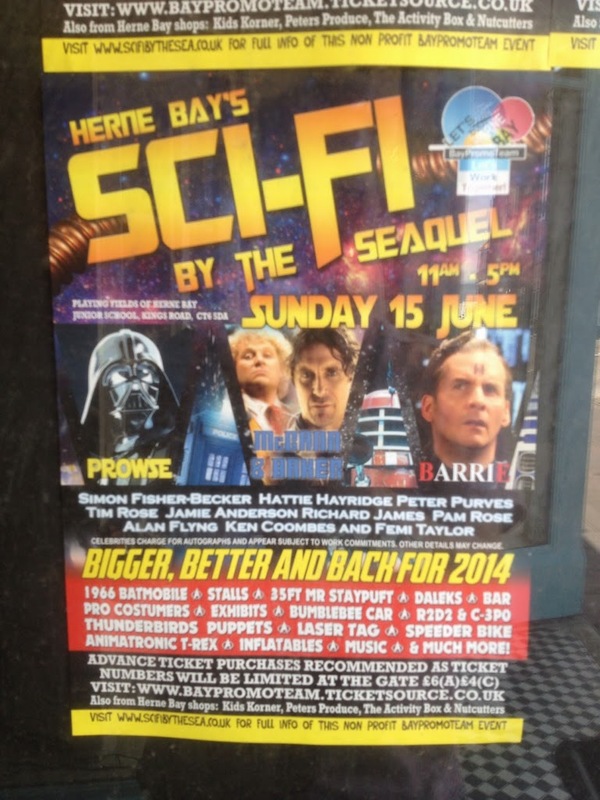 Not even 3rd (or 2nd) editions. 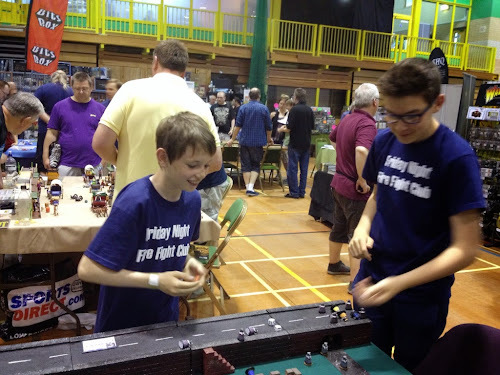 It's not a huge issue since the other games we do play at the club are all very enjoyable. 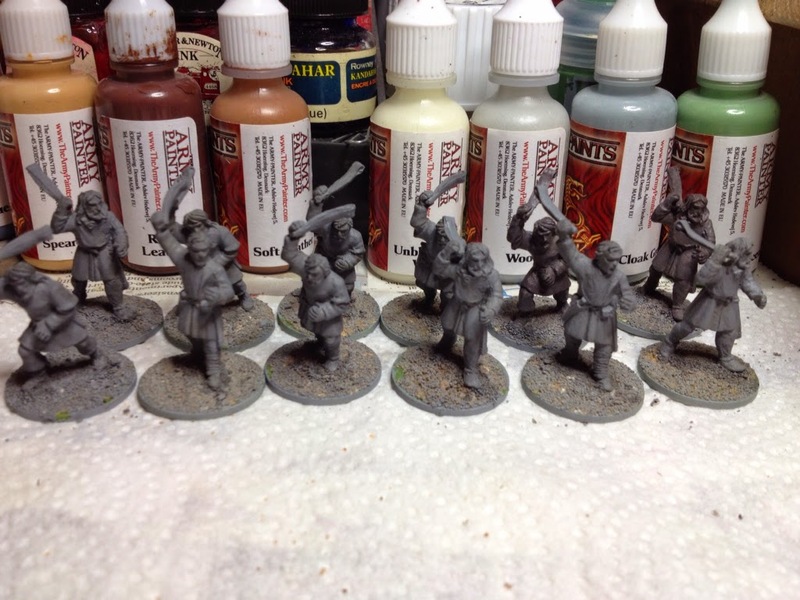 I have been itching to get the undead marching across the battlefield though. Fortunately a couple of folks have started to get into Kings of War. 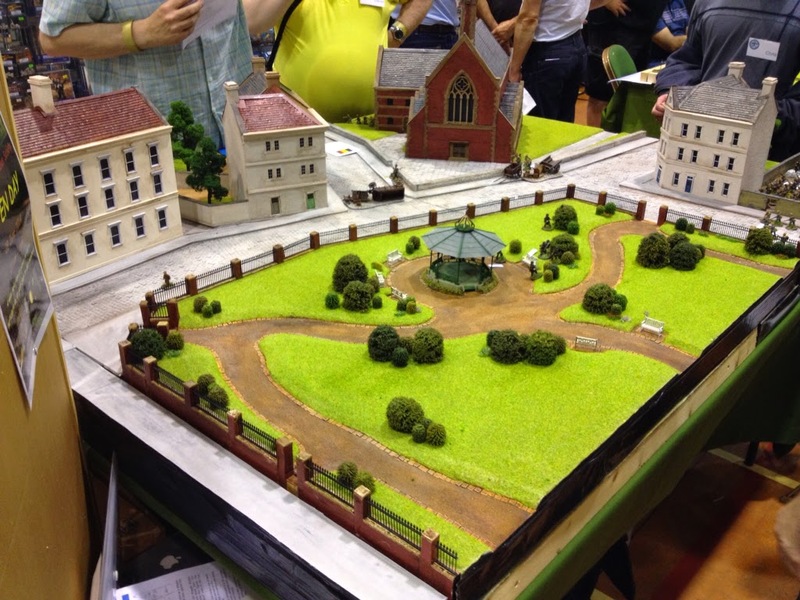 Although the rules appear to be simple (no bad thing) and there is very little narrative depth (boo! ), it does provide an excuse to get Vlad and the Shamblers, er shambling once again. 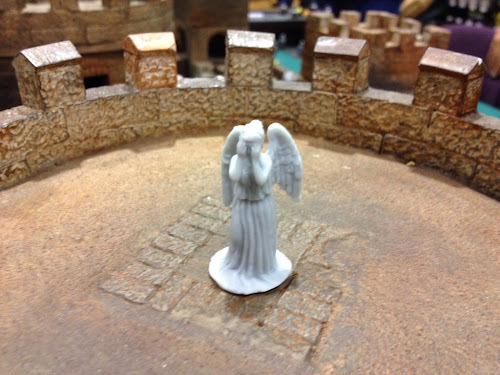 The first couple of games have been fun, but I've played from the perspective of 'what painted figures can I use this week?' 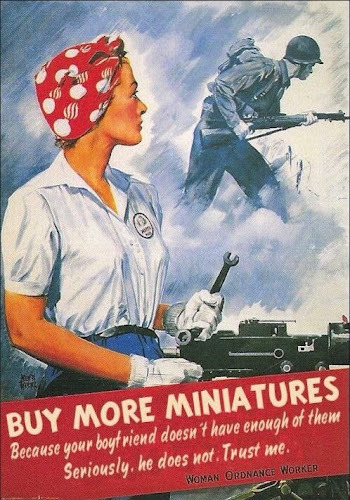 - rather than thinking about an actual army. 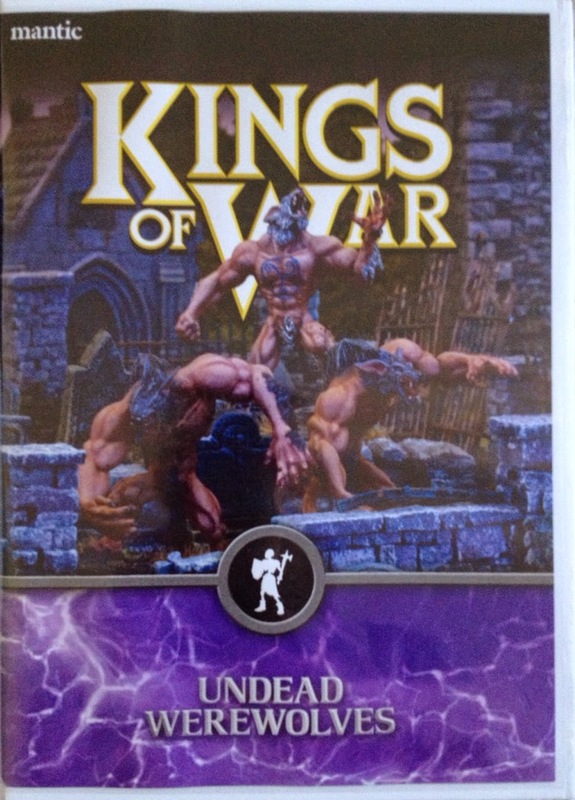 After all most of my effort with undead is geared towards completing a Warhammer force for 3rd edition. 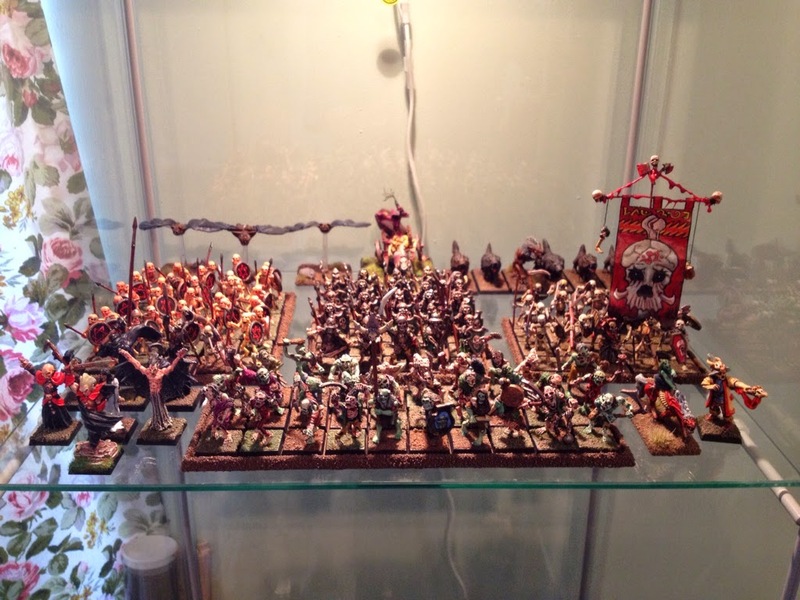 My Warhammer force has lots of zombies and skeletons. Not only does this fit in with the narrative of my games, but also plays to the strength of undead in Warhammer. In my last 3rd edition Warhammer game the undead routed my opponent's Norse off the table. Enemy units are automatically routed if they suffer more wounds in melee. Not so in KoW. 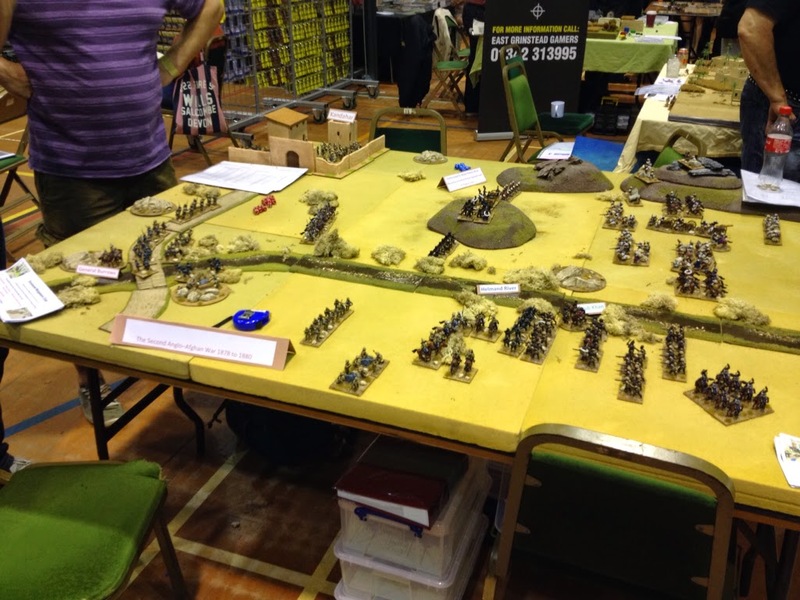 In KoW units don't even get to fight back if charged - that's taken a bit of getting used to! 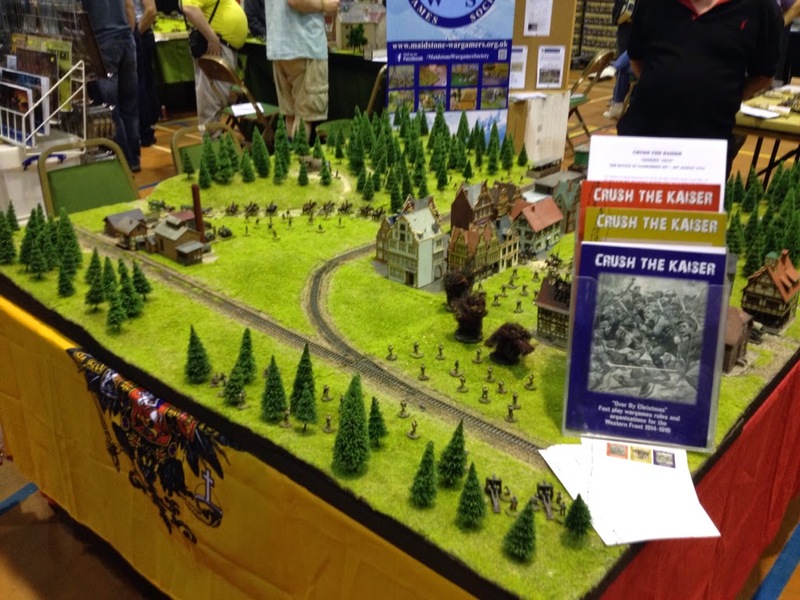 KoW is a game about strategic manoeuvring of units to ensure the enemy can be charged first. Three old (Grenadier?) wraiths attached to modern Renedra bases before being undercoated. In KoW, wraiths can fly with a movement of 10, 20 on a charge. What about the nasty hydra thingie that Mike used in his last game. It had a defence of 6 and proved a difficult nut to crack, even for my Revenant unit (KoW equivalents to Black Knights). I've wanted to paint these old barrow wights for a long time. With a crushing strength of 4 (ie. the enemy unit's defence is reduced by 4), they might just put that hydra in its place. Once painted, these old models can join my Warhammer 3rd edition army as part of the spirit host. I have another trick up my sleeve as well, but I'll save that for later. Thought it worth mentioning that a few folks have offered opinions on the lack of narrative in KoW and what it is that makes Oldhammer an enjoyable narrative driven game. 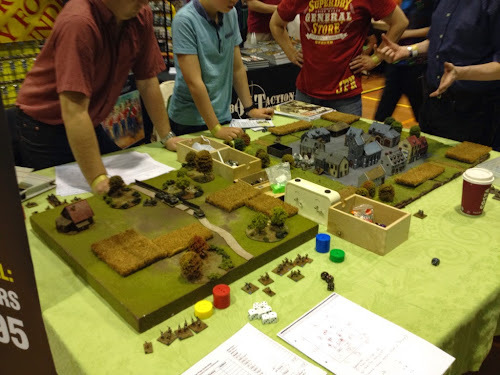 Paul Brown over at Here Be XP gives his thoughts on how different rulesets can be used to play games in the style of Oldhammer. Worth a read. I definitely agree with his first two points about characters and characterful units (my skeletons and zombies are frightening I tell you!). On the Oldhammer forum Leromides suggests that KoW could be used to conduct large strategic battles in campaigns along the vein of Mighty Empires. Again worth thinking about. 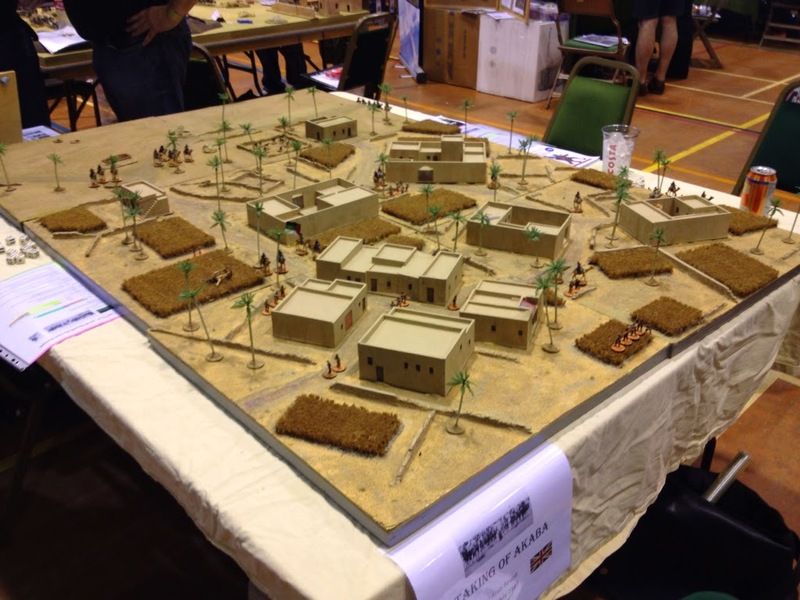 I have the Generals Compendium and it offers similar ideas for Warhammer (map based campaigns), but these could just as easily be applied to KoW. As I've previously explained, I usually have several projects on the go. These are often from several different game systems. 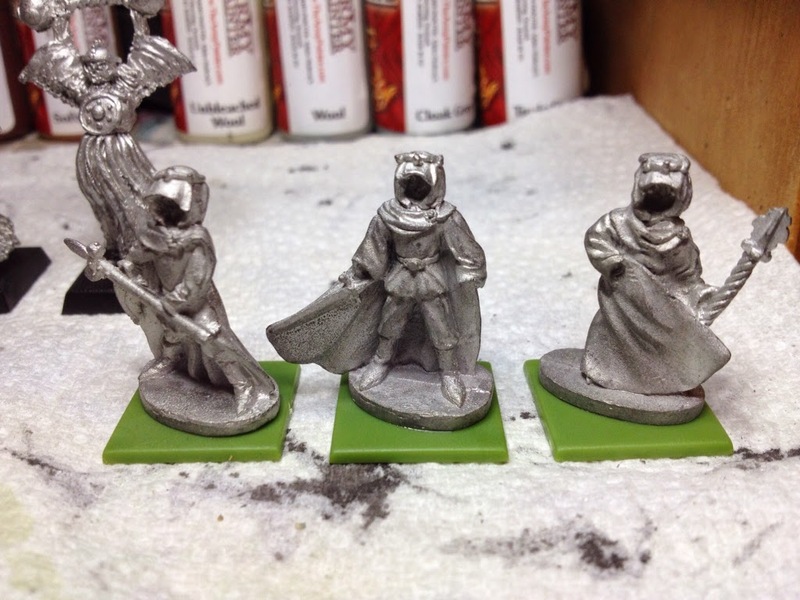 Painting may focus on getting a particular set of figures completed for a specific game or just because I like a figure with no intention of using the model anytime soon. My Varghulf falls into the latter category and has been sat on the table for quite a few weeks now. Unfortunately he will have to stay there a while longer. My current focus is Anglo Danes for SAGA and werewolves for Kings of War. 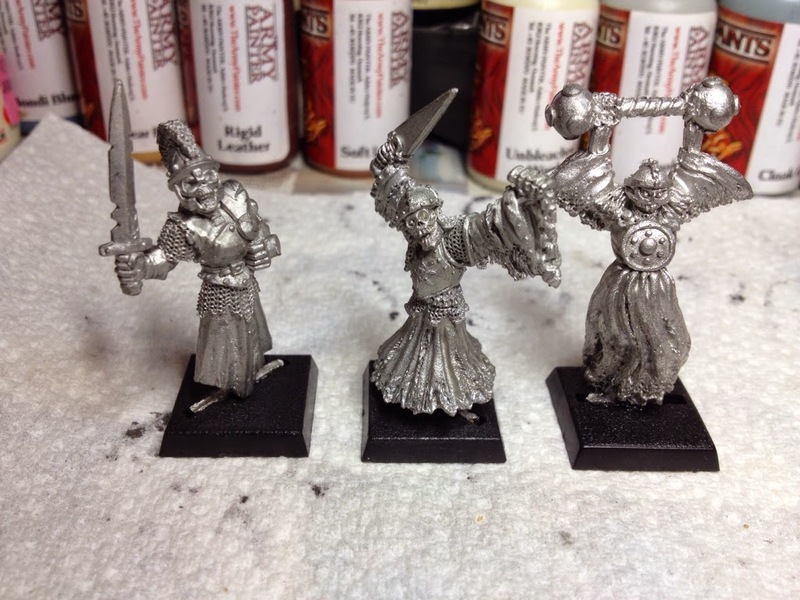 I now have 5 points of Anglo Danes, with one point of levy left to do. 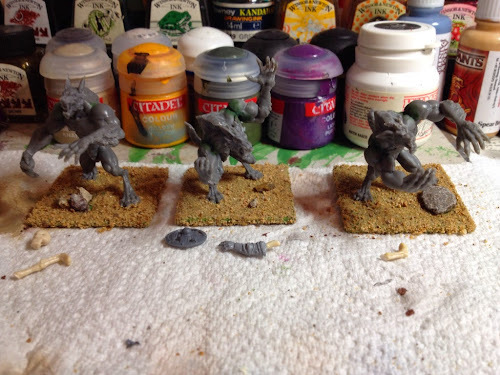 The rather well muscled werewolves I recently purchased have now been assembled. Last night I was at the Friday Night Firefight Club and played a game of SAGA with John F (aka Ducat). The scenario was Battle at the Ford and my Anglo Danes faced John's Norse Gael. 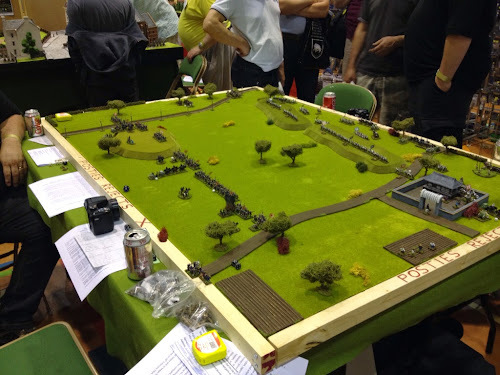 I haven't written a full battle report as such, I was much too busy thinking about how I was going to defend two crossing points against an opponent who could avoid melee by issuing a challenge... I did take a few photos mid battle though. Anglo Danes are on the left. Norse Gael won the dice throw and moved first. A large unit of javelin armed warriors surged across the ford throwing their pointy sticks as they advanced. My own 8 man warrior unit took quite a pounding and by the end of the first turn they were down to just a pair of stout veterans! 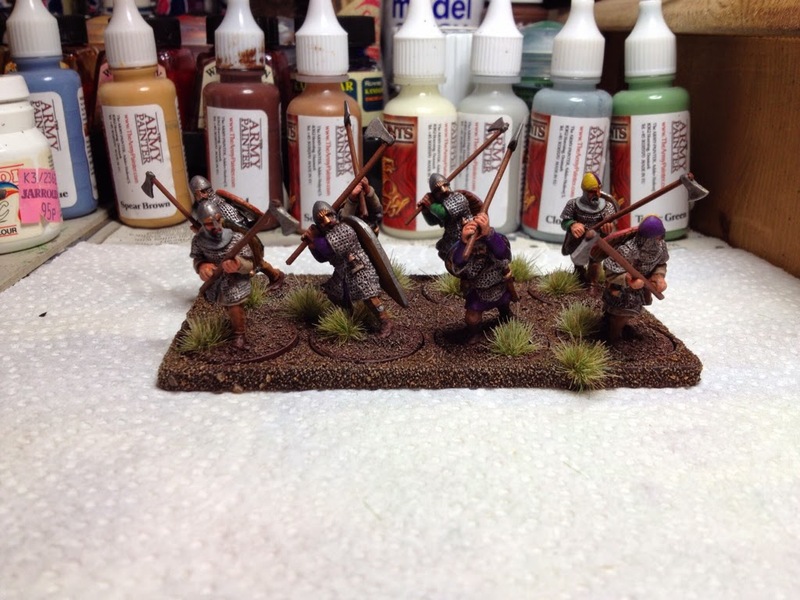 Whilst blood was being spilt, another unit of Dane Axe wielding Norse Gael warriors and their warlord can be seen in the background advancing on the ford. The battle was fierce, but eventually the Anglo Dane warriors were whittled down to a single man, who put up a defence worthy of his own Saga, but inevitably fell. The Norse Gael warlord advanced across the ford with his warriors and charged the Anglo Dane huscarls. Although the huscarls fell, they also took out all of the Warlord's warriors while pushing him back onto the ford, thoroughly exhausted. The Norse Gaels had won this section of ford, but at what cost? Only two javelin armed warriors were left alive (some judicious use of the Anglo Dane Exhausted ability proved helpful there!) and the exhausted warlord stood on the ford. Unless he could muster his strength and step forth he would earn no victory points. However, the Norse Gaels still had a unit of hearthguard in reserve and these now started to advance, after all what could stop them? Meanwhile at the bridge, the Anglo Dane warlord decided to hold his ground with two 4 man units of huscarls at his side. 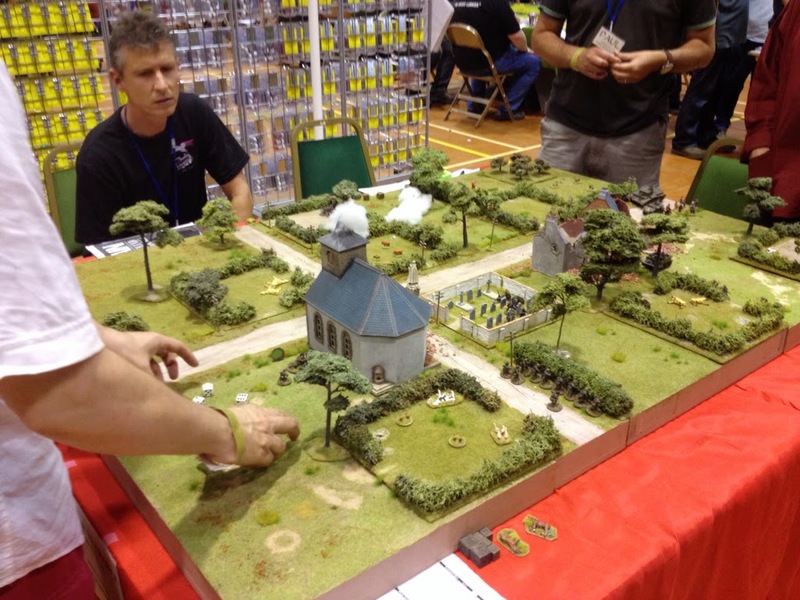 Despite being the only unpainted unit on the table ;-) the Anglo Dane levies really proved their worth in this game. They pelted the advancing Norse Gael on the bridge knocking one into the water. The levies then moved to the river bank where they were just in range of the Norse Gael warriors at the other ford. Although attacked by the advancing hearthguard, the levies lost only a couple of men and were pushed closer to the ford. This proved quite useful, since the levy were able to pelt the other unit of hearthguard reserves at the ford, taking out at least two and therefore reducing the number of victory points they would earn by crossing the river. Attacking Norse Gael can be tricky. Norse Gael have a special rule that allows them to issue challenges to their opponent. Battle board abilities can be used to give the Norse Gael player an advantage making it more likely he will win the challenge. Depending on the challenge, a victory means the Norse Gael can force the combat to end, loose fatigue, reduce enemy attacks etc. In our game, John was fond of the challenge that enabled him to disengage from combat and therefore avoid an unpleasant dice loaded Anglo Dane battle board. One strategy that I found helped to overcome this was to use a two unit punch. At the bridge, the Norse Gael hearthguard were left fatigued after their clash with the levy. 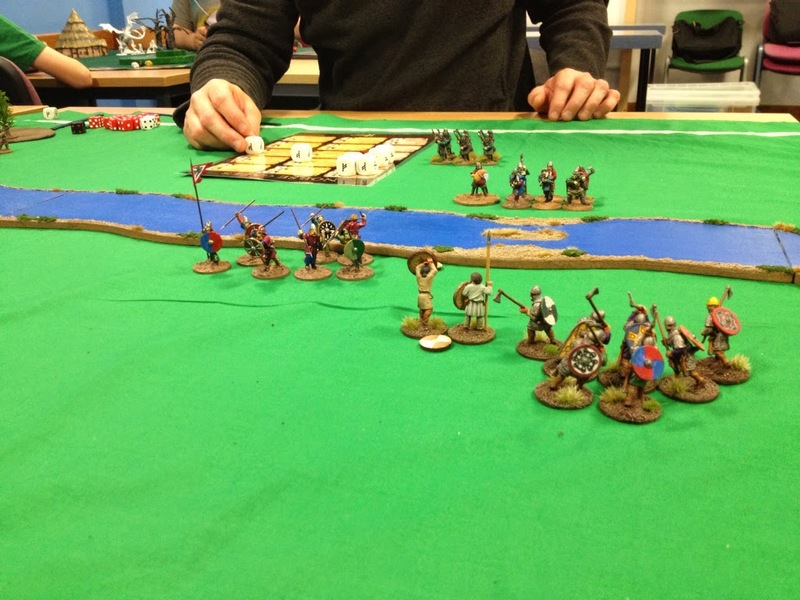 With a fully loaded battle board, a unit of Anglo Dane huscarls charged in. I was expecting a challenge to be issued, but since I had another huscarl unit in reserve I was ready! However, the Norse Gaels decided to face the charge, so the Anglo Danes brought forth Lords of Battle. This is a devastating battle board ability that not only provides 3 additional attack/defence dice, but also adds two additional fatigue on top of the one generated by the melee. Long story short, no one was killed on either side so the huscarls disengaged. BUT, the Norse Gael hearthguard now had 4 fatigue and were exhausted. That's right folks, I didn't spend the fatigue the hearthguard had gained from their encounter with the levy. I now activated my warlord and with side by side charged the hearthguard with a fresh unit of huscarls. Since exhausted units cannot issue challenges, the Norse Gael couldn't avoid the melee. Although two huscarls fell, the Norse Gael hearthguard were cut down leaving the bridge clear. 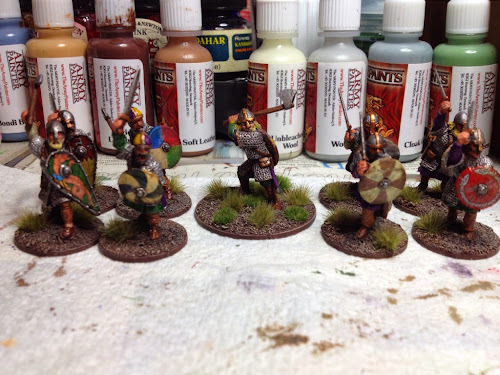 The Anglo Dane warlord raced across the bridge with his two huscarl units. Of course a Dane Axe wielding unit of Norse Gael warriors were waiting for him on the opposite bank and put up a stout defence. All of the huscarls were killed, but the Anglo Dane warlord slew his enemies and was able to earn 3 victory points when he stepped off the bridge. At the ford, the Norse Gael warlord had finally rested from his previous exhausted state and was also able to step off the ford earning 3 victory points. The remaining warriors earned another victory point and the hearthguard 4 more. 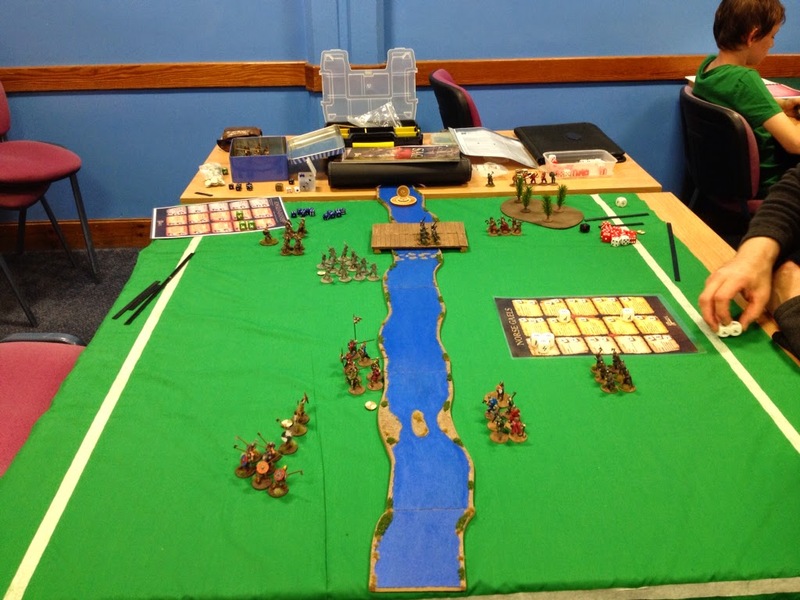 After a bloody conflict, the Norse Gaels had deservedly won 8 points to 3. 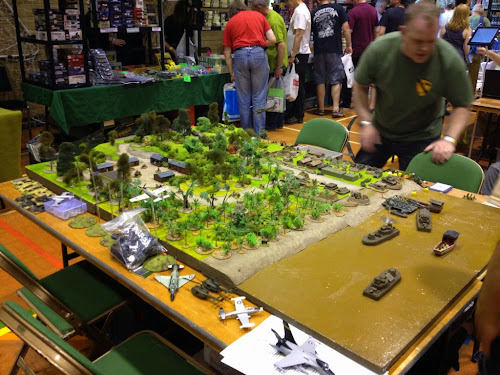 Still, it was closer than I was expecting and I did at least manage to get my warlord across the river - alive! Many thanks to John for a very enjoyable game. 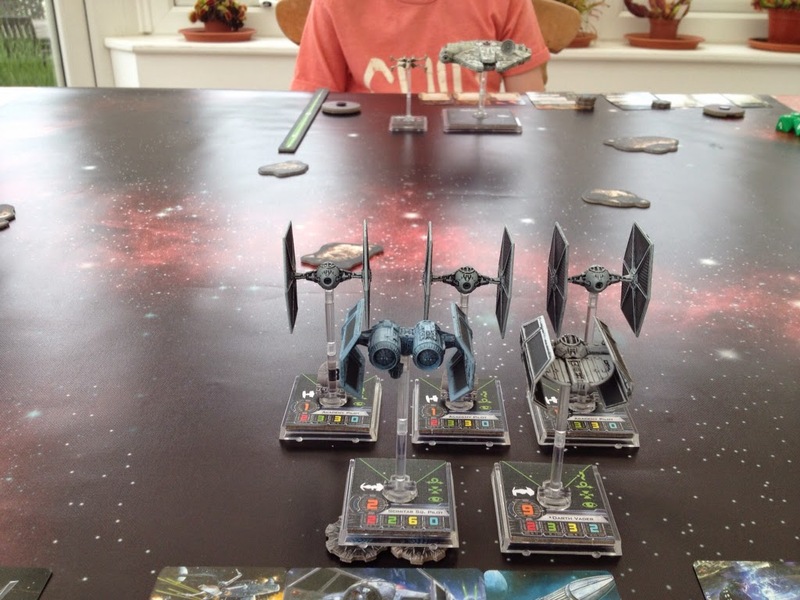 Kyle and I had another game of X-Wing on Saturday. This time though, we were able to use the shiny new battle mat that I purchased at Broadside. 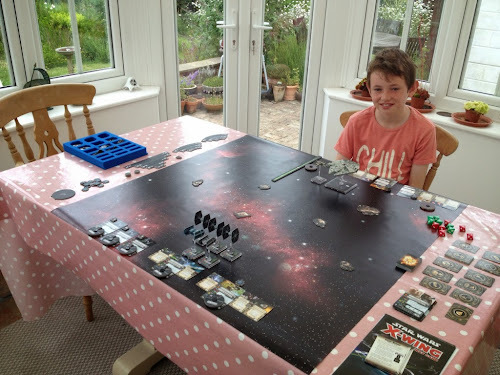 I played a Tie swarm, with 3 tie fighters, a tie bomber and tie advanced (with Darth Vader) against Mighty Kyle's rebel force. The rebels consisted of Han Solo in the Millennium Falcon and Wedge in an X-Wing. 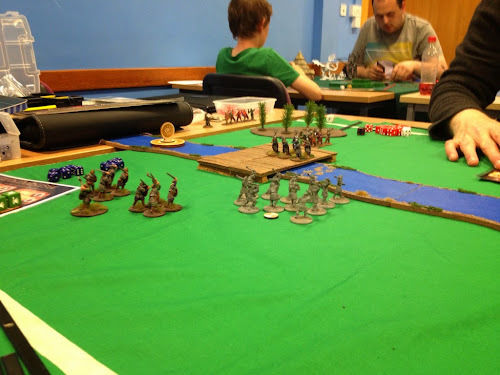 The rebels might look outnumbered but it was 100 points each. 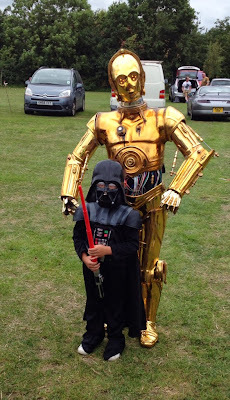 We had a fantastic day and managed to bag some great autographs, including one from David Prowse (yes the REAL Darth Vader!) and the 8th Doctor, Paul McGann. 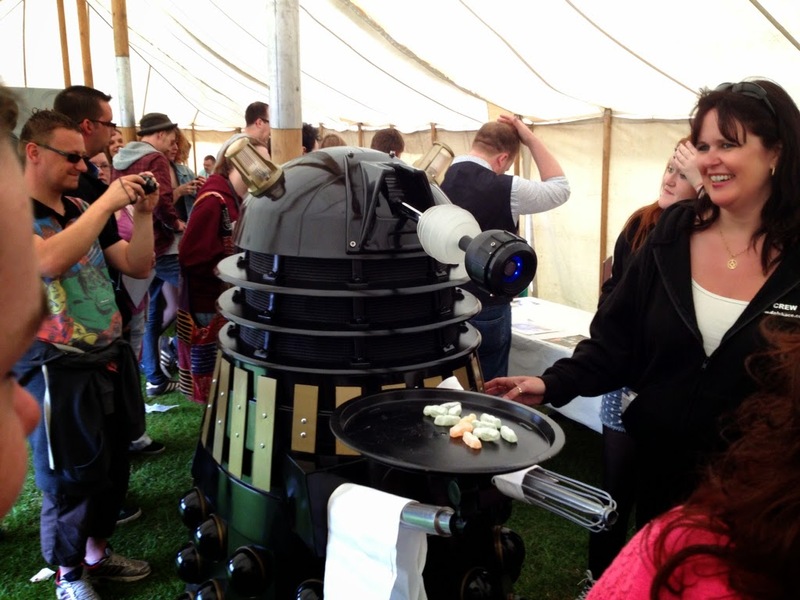 Jelly Babies will be EXTERMINATED! 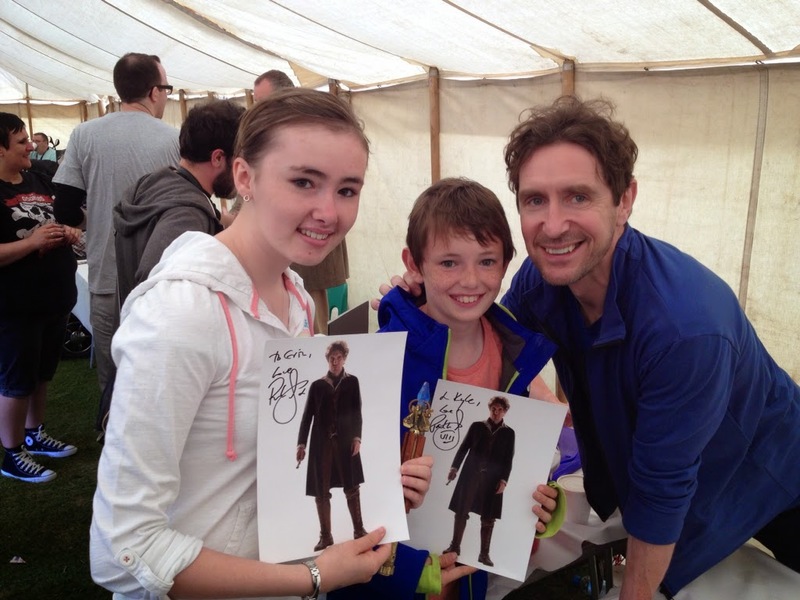 Tired but happy, we went home to watch several episodes of Doctor Who! 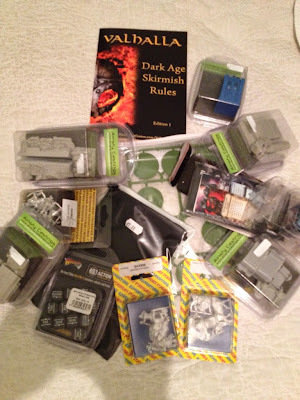 Following on from my game of Kings of War at the Friday Night Fire Fight Club last week with Mike I decided to splash out (yes again!) on some Mantic Werewolves. 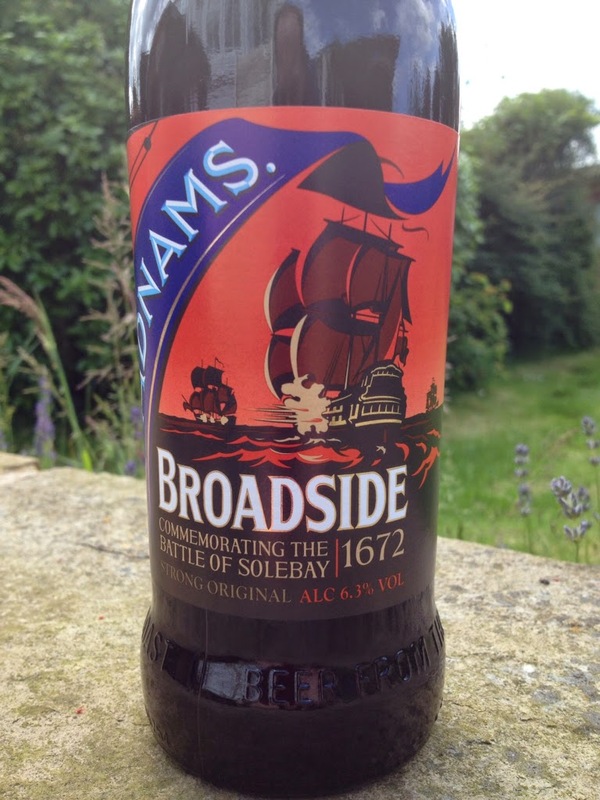 I had searched the trade stands last week at Broadside for these, but failed to find any. Yesterday I was disappointed to find that Xpress Games in Canterbury have just about given up on their Mantic stock. Well today I was in Rochester, so of course had to pop in Rochester Games and Models. 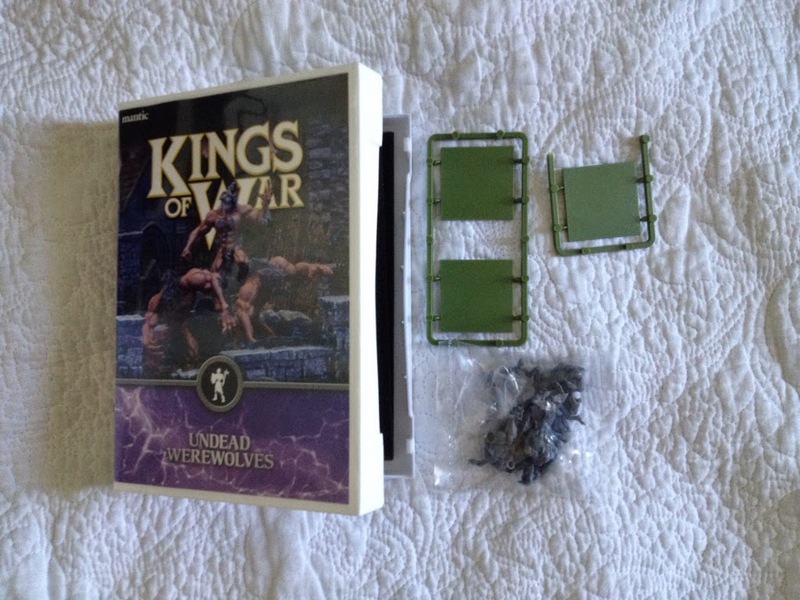 Low and behold they now stock Mantic (as well as Gripping Beast, Warlord Games, GW and many others) and I found a box of werewolves. ...that contains quite a small bag of werewolves. Oh well, they'll look impressive once they are assembled and painted. But that will have to wait. The Varghulf and eight more Anglo Dane huscarls are on the painting table. I've nearly finished the base coat of the huscarls and finally decided on a colour scheme for the Varghulf. 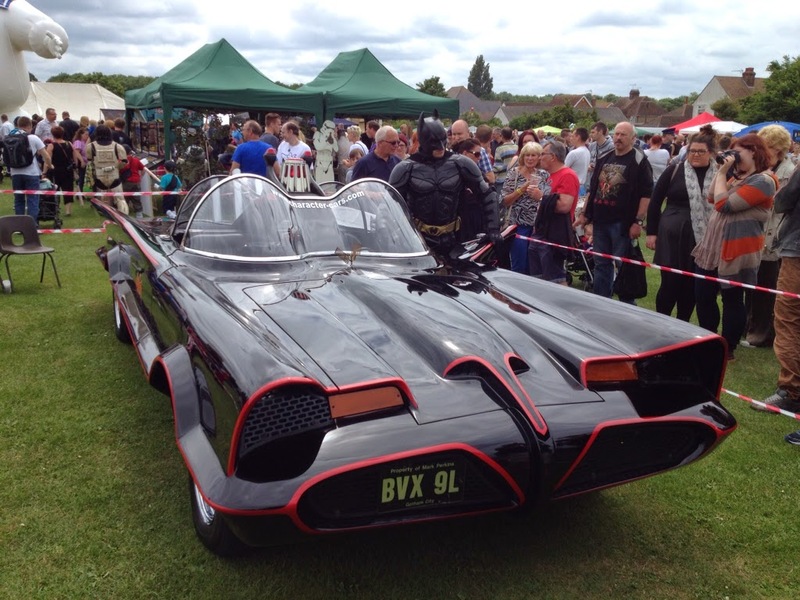 See, it isn't too bad really. Paul from East Street Games was at Broadside and gave a quick demo of Valhalla. This is another dark ages skirmish game, but plays quite different to SAGA. 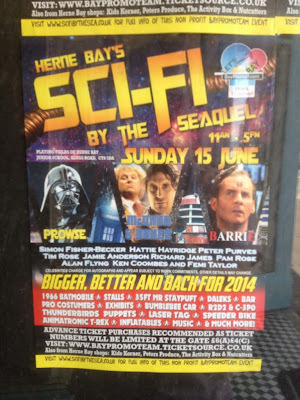 More about that another time. 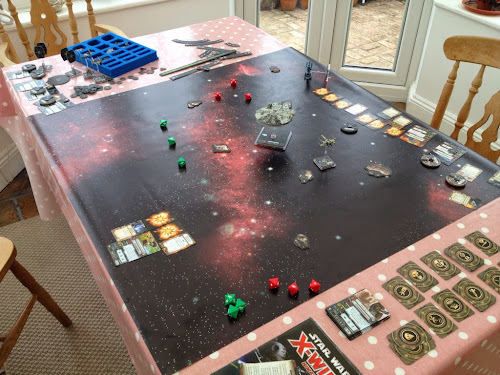 The X-Wing battle mat I bought isn't shown in the photo, but is worthy of mention because it came with a small discount. I've been eyeing one of these for a while but reluctant to pay what appear to be high postage costs. To pick one up at Broadside with a discount was a spot of luck. The mat is made from vinyl and has an attractive starry nebulae design. 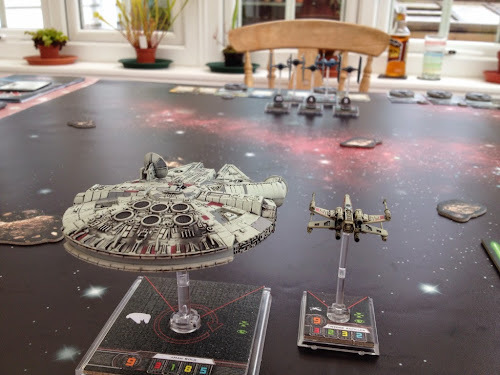 Next time we play X-Wing I'll post some photos. Yes, we're sad, but we're happy sad ! 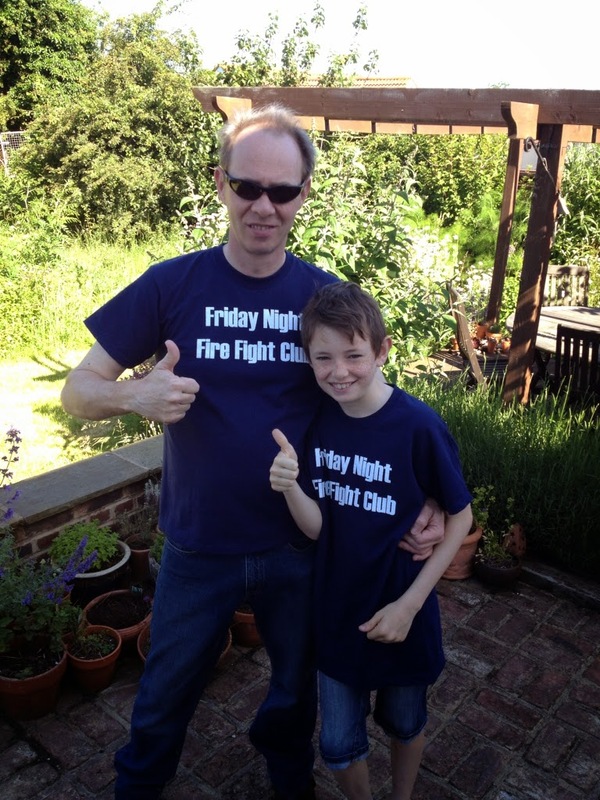 Friday Night Fire Fight Club were there with Dr. Who. This time Kyle was fighting the Daleks with his unit soldiers. 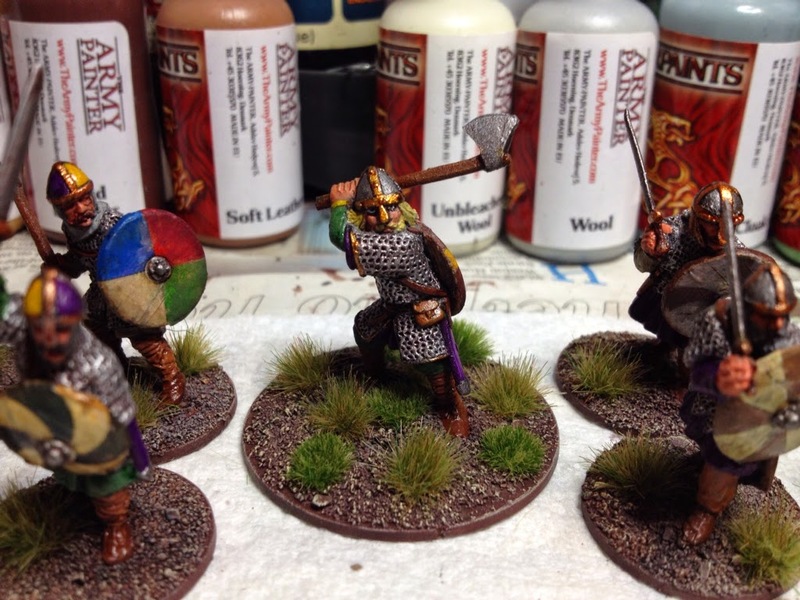 Dane axes provide some serious clout to these armoured hearthguard. In SAGA games, Dane Axes add +1 to die rolls in melee; crucially they don't lower armour by 1. This means that if the huscarls are fighting fatigue stricken unarmoured troops such as levy, the huscarls could be hitting on a d6 roll of 2 (if fatigue is spent). Normally armour can't be reduced to 1, but since the Dane Axe adds 1 to the attackers d6 roll it's still auto hit time. Tasty! The downside to the Dane Axe is that it requires two hands. This means that in melee, the huscarls can't use shields and only have an armour of 4 instead of the normal 5 that other non-mounted hearthguard benefit from. The huscarls still carry shields though and can use them as protection against missile armed troops. The huscarls therefore retain an armour of 5 against shooting. In melee the shields are thrown over the huscarl's shoulder and carried on their backs. I can't take credit for painting the shields. 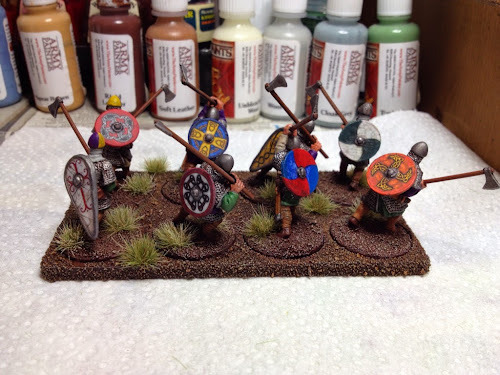 All shields were finished using transfers from the excellent Little Big Men.